If you are a job seeker dreaming of getting employed with the public or private sector, you might not have missed any of the issue of 'Thozhilveedhi', the real destiny of employment. Even though a number of employment newspapers are available, 'Thozhilveedhi' a published by Malayala Manorama is the favourite among youngsters who keep each issue of the newspaper close to their heart. The prime objective of this newspaper is to provide an effective platform on job vacancies, career training programmes, admittance notices relating to job oriented courses and result of recruitment exams. Each issue carries article on job opportunities in various areas and also emerging sectors. 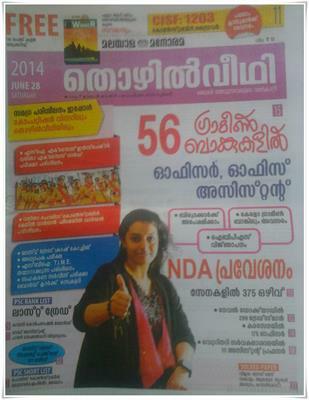 Published in malayalam, this employment weekly news publication has truly changed the life of many youngsters. With a circulation of more than 1 lakh, 'Thozhilveedhi' proved to be much useful for young graduates and other qualified persons who look for employment and seek to develop their outlook. This weekly is packed with advertisement for job of Kerala Public Service Commission, Central, State Governments, Public Sector Undertakings, Self-governing Bodies and Universities. Along with it, 'Thozhilveedhi' brings out admission notices for professional courses, exam notices and results of Kerala PSC. It serves as a medium to promote career opportunities. The best part of this weekly would be the 'Editorial' segment which carries an article worth reading. Each article investigates into the tragic incidents concerned with the job seekers. In many occasions, the editorial articles proved to be a blessing to hundreds of people as it opened the eyes of the authorities regarding the miss function of the system. Along with arranging crash coaching on important exams, previous year question papers with solutions are also featured in this employment weekly. Special articles on career guidance will give direction to readers about new and upcoming fields or professional activities along with information on the employment prospects in the area. Added to this, the qualifications required to enter the profession and the institutes to avail education and training is being clarified. A complete page is devoted for the readers clearing doubts about queries about Kerala PSC. So can anyone leave a single issue of this grandiose career guidance newspaper? Grab the latest issue of 'Thozhilveedhi' and find the real destiny and live your dreams.